PHOENIX — At the request of Gilbert Parks and Recreation, the Gilbert Youth Fishing Day, scheduled for 8 a.m.-noon on Saturday, Dec. 8, will be moved to Discovery Park located at 2214 E. Pecos Road. 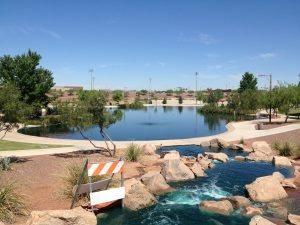 The initial location for this free fishing event hosted by the Arizona Game and Fish Department (AZGFD) and Gilbert Parks and Recreation was Freestone Park, also in Gilbert. The event is open to all ages. The first 200 kids ages 16 and under who register for the fishing event will receive a free fishing pole donated by Cabela’s. For those who register at the AZGFD booth, fishing licenses are not required during the planned hours of the event. AZGFD Sport Fishing Education staff and volunteers will be on hand for instruction. Also, AZGFD will loan fishing gear and bait to the first 100 participants who do not have their own gear. This is a great opportunity to spend the morning fishing with family or to bring a young angler who would enjoy the experience. For more information, visit www.gilbertaz.gov/events or contact the AZGFD Sport Fishing Education Program at (623) 236-7240.